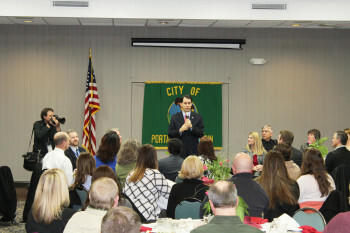 Portage – Governor Scott Walker delivered remarks today (February 4) at the annual Portage Area Chamber of Commerce Luncheon, which was hosted at the Best Western Resort Hotel & Conference Center in Portage. The Portage Area Chamber of Commerce is composed of businesses, organizations, and individuals who partner together to develop the economy in the community, attract new businesses, and foster growth. Their mission is to provide leadership for building a healthy economy and high quality of life in the Portage area. In Governor Walker’s State of the State Address, he announced investments in Workforce Development programs like Academic and Career Planning (ACP) and dual enrollment. In the fall, 25 school districts will participate in the ACP pilot program, which allows sixth through 12th grade students access to career planning that will prepare them for courses they will take in junior high and high school. This will set them up for a higher education path that is right for them and sets them up for success in their future careers. Governor Walker also announced an additional investment of $3 million in dual enrollment programs through Wisconsin Fast Forward, which will help students get a jump start on their higher education.